Because our goal is to send you home from Conference bursting with new ideas and knowledge, we thought we’d add something special to each day—a BIG idea. These are ideas and messages that can impact and empower the way you think, the way you act, the way you work. 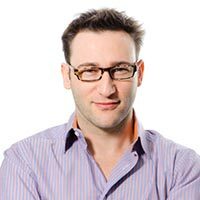 Simon Sinek is the author of Start with Why: How Great Leaders Inspire Everyone to Take Action and Leaders Eat Last: Why Some Teams Pull Together and Others Don’t. With a bold goal to help build a world in which the vast majority of people go home everyday feeling fulfilled by their work, Sinek is leading a movement to inspire people to do the things that inspire them. He has been featured in numerous national publications; is a regular contributor to The Huffington Post; writes at simonsinek.com; and makes regular broadcast guest appearances. He is an adjunct staff member of the RAND Corporation, a highly regarded think and is also active in the arts and not-for-profit world. When not in hotels, he lives in New York, where he teaches graduate level strategic communications at Columbia University. Pre-order books for the signing following this author event. Your books will be available to pick up at the onsite Barnes & Noble store next to registration. PLA thanks Innovative for its support of this event.